Attractive camp in private family compound on calm end of beautiful Clearwater Lake 9 miles from college town of Farmington. 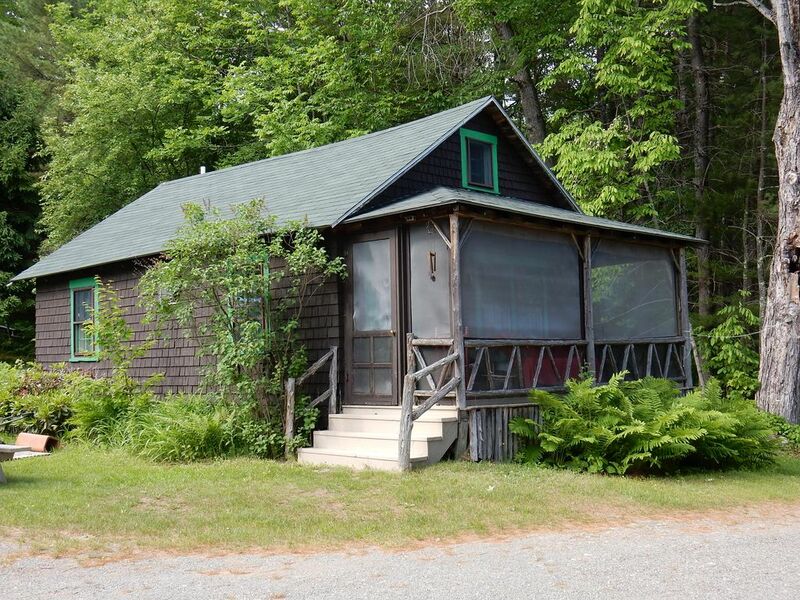 The camp has 2 bedrooms each with double beds, a loft with twin beds, a bath with stall shower, eat-in kitchen/living room with wood burning stove, screened porch overlooking the lake, picnic table, charcoal grill, and shared use of dock and swim float. The University of Maine and Franklin County Memorial Hospital are located in Farmington. Sugarloaf USA is just 45 minutes away. Amenities: Full-size refrigerator, coffee maker, stove, blankets, pillows, pots, pans, dishes, and all utensils are provided. Golf, tennis, restaurants, movie theatre, laundromat and shopping are nearby. Location, location, location - the best on the entire lake! Located between the two bedrooms with stall shower. Clearwater Lake is one of the state's cleanest. It is nearly 10 miles around and horseshoe shaped. On beautiful spring-fed Clearwater Lake. Clean, clear water with great fishing, dock and swim float. Shoreline is gradual and easy for little ones to swim. Prime location on the north shore of Clearwater - the best for water-skiing etc. telephone on side porch of main house and in cabana with nationwide phone and Wi-Fi service. Dining table in kitchen/living room area and a picnic table outside. There is a large lawn area on which kids may play. Aluminum canoe available for renters use at their own risk. Nearby in Wilton, ME and north at Sugarloaf Mountain. We rented the Barn camp and had a blast. The 4 of us met the renters in the other Overlake Camp one night we were out playing the guitar. They next thing we knew they joined in with a banjo, guitars, mandolin, & cello. We were all singing country and lovin it. People were coming over from around the lake to make the night something to remember. Wow! What a blast. The place was very neat and clean. Very rustic. No tv or radio, but we didnt need it. We rented a boat and loved the lake. We also found Mosher Hill Falls. It was beautiful. Thanks for a great time. Property is located at the north end of beautiful Clearwater Lake in a very private setting a short distance from Farmington, a college town. It is a great place to relax and get away from the hectic world outside - there is limited radio and cell phone reception leaving time to enjoy nature, family and solitude. Nearby are restaurants, golf, tennis, hiking, shopping, movies, delicious ice cream and wonderful organically grown vegetables for sale. Other Activities: A canoe is available for use at your own risk and to be shared with other renters. The clean clear lake provides wonderful swimming and fishing. The surrounding hills are great for hiking. Golf: Golf is available in Wilton - about 12 miles away and at Sugarloaf Mtn. - 45 min. away. Rental Rate: $850/week +tax & cleaning - Saturday to Saturday $200 deposit required to hold dates which will be applied to rent. Final payment is due 6 weeks prior to start of rental for rent, tax & cleaning fee Rentals run from Saturday to Saturday.